The women in my family are very sentimental. Admittedly, I share this trait. My mother has always held onto the little keepsakes that were passed down from our relatives. Recently, she remarried and is in the process of selling her home in order to move abroad with her husband. This means getting rid of an enormous amount of boxes containing dolls, artwork, knick-knacks and vintage furniture. To my annoyance, she’d dropped off several boxes at my apartment; including, but not limited to, clothes I wore in 7th grade, report cards, science fair ribbons and other useless memorabilia. I don’t have a ton of space in my home so I’ve been sorting through the boxes and slowly getting rid of things. I was having the usual thoughts of “Oh, why is anyone still hanging onto this?” when I stumbled upon a scrapbook and a journal belonging to my grandma Iva from 1934. She never failed to document what she ate- lots of sodas, cakes and ice cream- and later complained of a tooth ache (wonder why). She also always wrote down how many drinks she’d had. “5 whiskey sours”, “3 rum high-balls”, and Marilyn Monroe cocktails. She talks about boys driving her home, “necking” in the car, and always documented what time she got in. I loved seeing the first mention of my grandpa Ray: “8 whiskey sours. Ray very nice. I felt fine.” - to reading about their little fights: “Thurs night. Ray and I to Planet Mars. Me angry at Ray. Had one shot. Ray said he was disappointed in me because he thought I had a lot of boyfriends. He asked me if I had a collection of fellows pictures. Nuts.” She eventually started referring to him as her honey. On the last page of the diary, she had written Ray’s name over and over and tallied how many dates they’d been on- a whopping 64 compared to Art’s 26. I’m glad she chose Ray Jensen. As I’m writing this, I’m realizing that Iva passed away on this exact day, February 12, 1996. I was 8 years old and watched as she died of a heart attack, which was a very traumatic experience for a child. We were close as could be- I would call her and sing the Mr. Rogers theme song..”Won’t you be my neighbor?” I always regretted that she died so early on in my life. Like my mother, she kept a lot of things that may have been insignificant to the outside world, but this discovery was invaluable. What a treasure trove of memories. Thank you for this incredible gift, Grandma. I’m lucky to have visited many places during my lifetime. Places that were grand, majestic, glittering, far-flung, exotic. Anyone can appreciate the beauty of travel. But there are also certain places that capture the heart in the humblest of ways; places that aren’t outwardly impressive or monumental. Sometimes what we need for the soul is right there amongst the ordinary. My partner and I stayed at a family farm during our time in Detroit. No one paid us much attention; there was work to be done. Right away I noticed the sounds flowing in from outside and walked to a window to find a little African American girl, maybe 4 years old, wearing a pink dress and cowboy boots. She was walking around in the hay, squatting down to pick up distressed ducklings with her entire body the way kids pick things up. She was followed closely by two dogs, more distressed ducks and the most banged-up, tattered chicken I’ve ever seen. It was a cacophony of quacks, barks and little girl squeals. I watched this child and thought about how my grandmother grew up on a farm and had pet pigs and had to wake up early to milk the cows before school and was kicked in the head by a horse and would live to tell the tale to her granddaughter. At one point in time, this is how simple life had been. We learned that they grew mostly “salad stuff”- arugula was the only thing specifically mentioned. That was what they sold at the market on Saturdays. They had to get rid of the goats because they kept finding ways to escape. Proud portraits of this farming couple hung on the walls. Inspirational messages scribbled on the chalkboard. I took my camera and explored out back and found a cilantro crop and a small bee collection. A swing hanging from a tree. A hut they had built out of old doors. By the second day of our stay, new guests had moved comfortably into the unfinished hut. I could keep writing but there are some things that just can’t be described in words. I’m going to leave it to the images to convey my feelings about a place so humble and yet so unbelievably special. Last Monday, this small town girl from Chicago walked all over Lower Manhattan trying her hand at some NYC street photography. It was already mid-afternoon and I was standing on the corner of Prince & Broadway waiting for something to happen. (And, of course, secretly hoping I'd bump into Dave Gahan.) The sun had been hiding all morning but was finally starting to light up the west side of Broadway. I spent about 30 minutes darting from one corner to the other in this intersection, trying not to get run over by the massive rush of people, bicycles and pure-breds. I decided I was going to hang out and watch a certain patch of sunlight when I spotted a man in a blue hat and scarf crossing the street. I thought I had seen him a few minutes before but wasn't sure. I snapped a quick photo and moved on westward down Prince. I stopped to talk to a man selling t-shirts who loved film photography, and took his portrait. He was set up next to a lady selling hats and I took her photo as well, not knowing I was being watched. She asked me not to take her picture, so I kept walking, feeling a bit discouraged. I stopped at the next corner, turned around, and again saw the man in the blue hat and scarf. He was leaning there just smoking his cigarette and watching. I took his photo. He saw me, shook his head and started to walk away. I took it that he didn't want to be photographed either and moved on to the next corner. I was snapping away when I felt a tap on my shoulder. I turned around, and it was the man in the blue hat and scarf. He asked me, "Can I ask you a question?" For a split second I thought that he was angry with me for taking his picture and that he was going to ask me to delete it. But instead his face cracked into a smile and he said, "Can I take a picture of you…taking pictures?" “Yes”, I said, “Of course! But here? There's not a lot of people.." He said not to worry, he'd photoshop some people walking by me. I got a kick out of what looked like a seasoned, local photographer squatting down taking photos of ME, a total newb. Then we chatted for a bit. 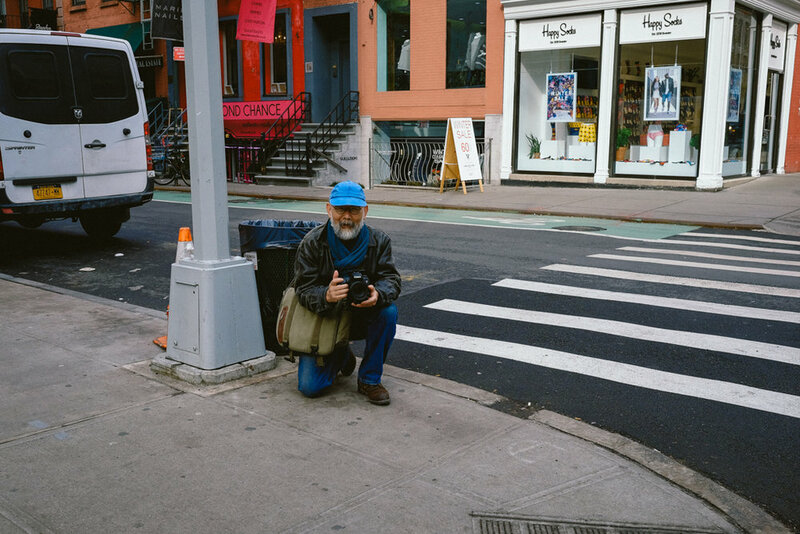 His name was Hirotsugu, and he told me he liked to hang out on street corners and take photos of people walking, especially in front of nice backgrounds. He showed me with pride the giant viewfinder that he had somehow attached to the back of his digital camera. I asked if I could take his portrait too, and to my delight he said yes. He asked if he could post his photo of me on Facebook, to which I said yes, of course. We exchanged emails and he later sent me my photo and a screenshot of his Facebook post. In street photography there seems to be two types of shooters: ones who ask their subjects to pose and ones who do not. I'm still figuring out my approach, but I'm learning that people tend to appreciate conversation and getting to know one another first. We put on an exterior for others, whether we do it consciously or not. When we are photographed candidly we open ourselves up to vulnerability and some folks don't like that. They want to know how they are being portrayed or how their image is being used. Some cultures believe that a photo will steal a part of your soul. That is another conversation to be had. But this interaction showed me that most people are approachable. We are never alone. There is always someone willing to open themselves up to you. You just have to ask. Winters in Chicago always send me into a creative funk, but sometimes we need stagnation in order to grow. Today I took advantage of the sunshine and went for a long walk with my camera. I had been battling a migraine and self-doubt all week and thought some fresh air might do me good. I took photos of trees and whatever objects I found interesting, but I was bored with the content and internalizing my frustrations. I decided to cut my losses and go home when I began craving french fries, and in a few minutes, I was at Mc Donald’s. I sat down and began scarfing my food. It took a couple minutes for what was going on around me to sink in. An old man sat across the room with a large boombox plugged into the wall, listening intently to a political talk show with a furrowed brow. He looked like he was taking notes. Then he laughed out loud. I almost didn't notice the old woman sitting next to me. She had taken a vase of plastic flowers out of her bag, set them in the middle of the table and was eating her breakfast sandwiches with a fork and knife. I sat there for a while and soaked up this beautifully bizarre environment, forgetting where I was, forgetting my self-doubt, becoming the quiet observer. For me, it's moments like these that make everything worth it. Moments that call into question your place in this world. Moments that make you feel small and your problems irrelevant. All we have to do is allow ourselves to notice them. Every December, I turn inside and reflect. I spend a lot of time thinking of all the change that occurred in the past year and the people who made an impact in my life. I reevaluate my relationships and make new commitments to myself and others. At the beginning of 2016 I was a miserable paralegal who would sit at my desk from 9-5 and daydream of bigger things for myself. The ideas in Karl Marx’s essay “Estranged Labour” haunted my thoughts: I was alienated from my work, which did not enrich my soul. I was alienated from my mind and body, forced into a sitting position 8 hours a day causing back and stomach pain, estranged from my creative energy in an unawakened state. I felt alienated in that I dreaded meeting new people for fear of being asked what I did for a living. This April I finally worked up the courage to quit that job and take a three-month trip overseas. Armed with new knowledge from classes I had been taking, my goal was to work on a portfolio during that time and transition into a career of photography when I returned. During my travels I must have passed through a thousand crossroads, which was fitting as I found myself at the biggest crossroad of my life so far. While I was in Tokyo, I spent a lot of time alone. It was the last leg of my trip, I was very broke and it rained non-stop for the first few days, making it difficult to get around and make photos. I was feeling quite lonely and in a bit of a funk one rainy night when I discovered the Japanese word “Ikigai”. “Iki” means life, alive; “kai” means an effect, result, fruit, or worth. Together it means “a reason for being.” The Japanese believe everyone has an Ikigai, though it may take a while for one to ‘find’ it. I was emotionally floored by the timing and meaning of this discovery. The next day it was sunny and stayed that way for the rest of my time there. I found my inspiration where I had lost it and my camera never left my hand after that. Coming home was easy, as I was eager to see family and friends, but I quickly realized that I had so much more to learn. I had spent my entire post-college life working in office environments where tasks were simply handed to me. Completing these tasks was automatic and required no thought or imagination. Transitioning from a desk job to a freelance position has been a learning process for me like no other. For once in my life I have to create my own work, find my own clients, market myself, put myself out there like I’ve never done before. I haven’t had a steady paycheck for 8 months and I couldn’t be happier. Every day is different, I've met a ton of amazing people, I’m constantly learning and being challenged in ways I didn’t know existed. And who was it that helped me get to this point? WOMEN. It was a woman who believed in my vision and got me my first gig doing BTS photography for her production company. It was a woman and her sister who believed in my ability and booked me for my first wedding in 2017. It was women who noticed and praised my photos from a recent art performance that led to being offered a paid photographer gig this upcoming New Year’s Eve. It is because of a single, strong, incredible woman that I exist and I thrive in the face of challenges. Here’s something about me that I hate to admit: as a teen I used to be one of those girls who thought I “wasn’t like other girls”. I had more guy friends, I was “one of the guys”, I was a “cool girl”. The older I get the more I realize that I was so terribly, utterly wrong in my thinking and attitude toward my own gender. This month I was given a final assignment in my photography program. We were asked to choose a theme and submit 6-12 images, and that’s it. As soon as I left the classroom I knew exactly what I wanted to do. This was no longer just an assignment but instead became a very meaningful, on-going project - my first project!! In the past few weeks I’ve met so many brilliant, talented, inspiring, strong, feminist, badass women who all believe in my dream and vision and who have given me mountains of support and encouragement in the making of this project. These women have been sources of strength and light and love and art, during a year that has caused so many people hurt and fear. I hope to continue to surround myself with people who lift each other up and make a better commitment to lifting up others. While the project is not yet ready to be unveiled, I hope you enjoy a few more photos from my time in Tokyo, where I received a divine confirmation of my Ikigai. 2016 has been a great year. I can’t wait for the next. One of my most vivid memories as a kid was going out to dinner in Chinatown. Eating out was not something my family did often; we did so maybe every other month and on special occasions. When we did venture out somewhere, it was really exciting for me and my sister. Going to ‘Chinatown’, in particular, meant going to this magical place with big fish and lobster in the windows, unlimited flavors of bubble tea, shops that carried a rainbow assortment of jellies, Pocky and Koala Yummies, the rotating plate in the middle of every round table (that we jumped at any opportunity to spin), fortune cookies that we couldn’t wait to break open and- if it was a “good” fortune- bring the little paper home to keep forever, and tantalizing smells that, to this day, bring a wave of nostalgia to my mind. Something that really intrigues me is visiting a place I once frequented as a child and taking notice of how my perception of that place has changed with the passing years. Whenever I return to the Philippines, for example, I’m always amazed at how differently I see things, how quickly familiar surroundings bow gracefully to new discoveries. Recently, I thought about how I hadn’t been to Chinatown in a very long time and decided to explore it with a pair of fresh eyes. It was a super hot day, I was sweating buckets, my camera bag seemed to weigh 100 pounds and suddenly it felt like I was back in SE Asia on one of my backpacking trips. The Sears Tower looming in the background- which I somehow never noticed as a child- reminded me of where I was. Rather than vapors of delicious restaurant food, I was met with the smell of urine, and it was more prominent than I ever remembered. The next thing I noticed was the average age of passers-by; most were elderly folks, moseying from shop to shop with arms crossed behind their backs or hands full of plastic grocery bags. I was glad I had the foresight to bring my umbrella; my initial thinking was that Chinatown would be the only place I could walk around with an umbrella on a sunny day and not attract stares. I was correct in my assumption and blended in quite well next to all the brightly-colored parasols. The shops looked much more deteriorated than I remembered and carried a lot of jewelry, souvenirs, Chinese herbs, and produce which was sometimes placed out on the stoop, browning in the hot sun. It was a quiet and peaceful place, except for an old cook who yelled at me after I tried to snap a photo of her kitchen. The square was much, much smaller than I remembered, after walking the 5-6 blocks and reaching the end of it, though I’m sure places seem much more expansive through a child’s eye. Looking back, the real reason I enjoyed Chinatown was because it was a place we went as a complete family, sitting pushed up under the thick red tablecloth between my mom and dad, always disappointed that dessert was an almond cookie and not chocolate cake. It was my mom telling us not to fill up on soda; it was my dad embarrassing us by sneezing loudly with chunks of food flying everywhere for five minutes straight whenever he ate something peppery; it was practicing with my sister a “secret language" we thought our parents couldn’t understand. I’ll never recall the conversations we had, but the togetherness is the feeling I’ll remember and cherish the most. For the people living in Chinatown, however, it isn’t just a one-off dinner for them. The sweaty folks helping their friend move into a second-story apartment, the old men wearing sweatpants and rubber slip-ons, standing around talking and smoking cigarettes, elderly couples helping each other cross the street...this togetherness, while holding fast to Chinese language and traditions, is abundant every day, and it's what has kept the community vibrant and thriving for a hundred years. I hope I can continue this tradition of togetherness, of making it a point to sit down and eat dinner at the same table, of attending to the weights and making sure they are wound as the clock ticks away.. In February 2016, I came across a Wired article which featured photographs by Thai photographer Rammy Narula taken at the Hua Lamphong station in Bangkok. I was totally captivated by the light in his photos. As a photography student, one of my biggest challenges has been learning how to use light to create better images. Sometimes the light isn't under our control, and we have to work with what we've got. Other times, we have to be able to recognize the "right" light when it graces us with its presence. What inspired me the most about Mr. Narula's story is that he frequented and photographed passengers at this train station for four years before seeing the light at Platform 10. I don't think he just stumbled upon it. He had learned to see it. And now I had to see it, too. I've been to Bangkok a few times, mostly using it as a jumping-off point, to visit my dad in nearby Pattaya. This year's trip was different, as I was in the middle of my photography program, armed with fresh knowledge and a shiny new FujiFilm X-T1, ready to take on the world with my camera. I wanted to see if I, too, could capture Mr. Narula's magical light, and the way it made such a plain-looking train station look so enchanting in that beautifully dark, shadowy film noir style. I woke up at 5:30am to catch local bus #53 to Hua Lamphong. I had never taken the local bus before, but being in Bangkok I knew that it was never a bad idea to leave early. I only had one day in BKK (my bus to Pattaya was already booked for later that afternoon) and was so engrossed in the pursuit of this light that I didn't grab food or even water for fear of missing the shot. The train at Platform 10, bound for the northern city of Chiang Mai, was supposed to depart at 7am. I arrived at 6:45, grateful that I had woken up as early as I had; walked around, took a few photos, and sure enough it was 8:15- Thai time- before the train rolled in for boarding. I had been sweating and hungry this entire time and was grateful when it finally came. Unfortunately there weren't a lot of people on the platform that morning, but I saw the light, and it was indeed magical, blasting through the gap between the train and the roof of the platform, casting beautiful shadows on everyone below; clouds of mist floating at my camera as the cleaners walked by with their power-washer and window mops; me drenched in sweat and furiously clicking away. For that brief moment, everything else- my thirst, my discomfort, my anxiety- disappeared. It could have been twenty minutes, but it felt like two, and suddenly the train blew the whistle and it was off. I caught the bus back to my hostel, severely dehydrated and starving with just a handful of good shots, but the effort was all worth it. The feeling is hard to describe, but that day I felt more in-tune than I ever have with a camera in my hand. I welcomed the pressure of only having one opportunity, one brief window of time, to step up and do what I came to do. But the hard part was already done for me, thanks to Mr. Narula. His work inspired me to chase that light, to always be vigilant, to mind that gap and never think that you've learned it all. Because you can always find beauty in a familiar place; you just have to be able to recognize it. I hope you will enjoy the photos as much as I enjoyed shooting them.